Barbados beaches. Crystal clear Caribbean waters lapping soft, white powdery sand. Palm trees laden with ripe coconuts. Blue skies stretching into an endless horizon. West coast Barbados beaches have all that, and more. Did I mention the stunning sunsets? 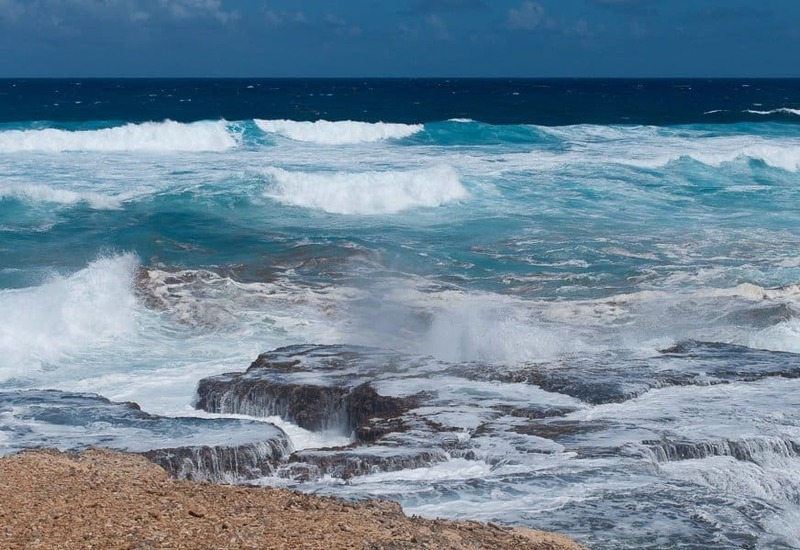 But on the Atlantic facing East coast Barbados is rugged, dramatic and altogether different. 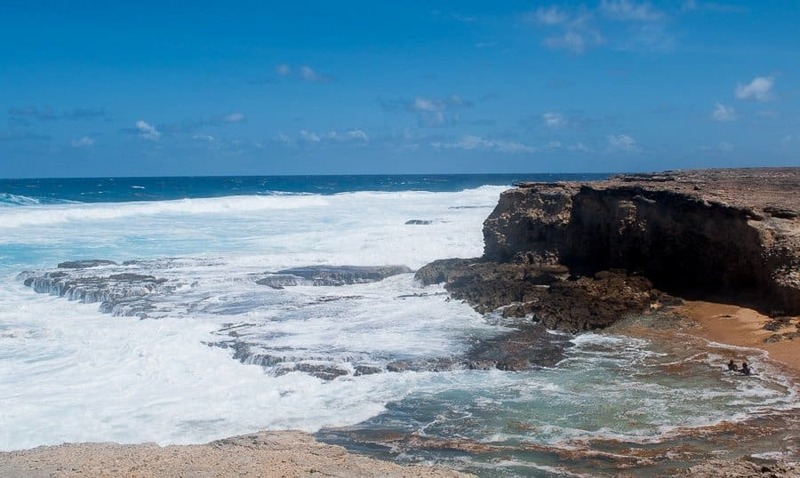 We took a mini Bajan road trip to check out the sightseeing on the wild side of Barbados. 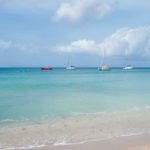 We stayed at Cobblers Cove on West coast Barbados which was total calm and bliss but after a few days my wanderlust got the better of me. 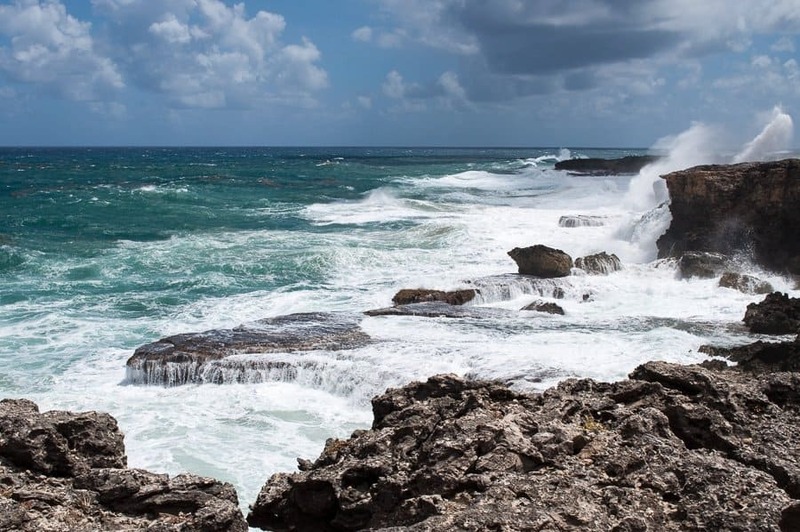 We hired a car for a day and set off to explore the invigorating East coast of Barbados. 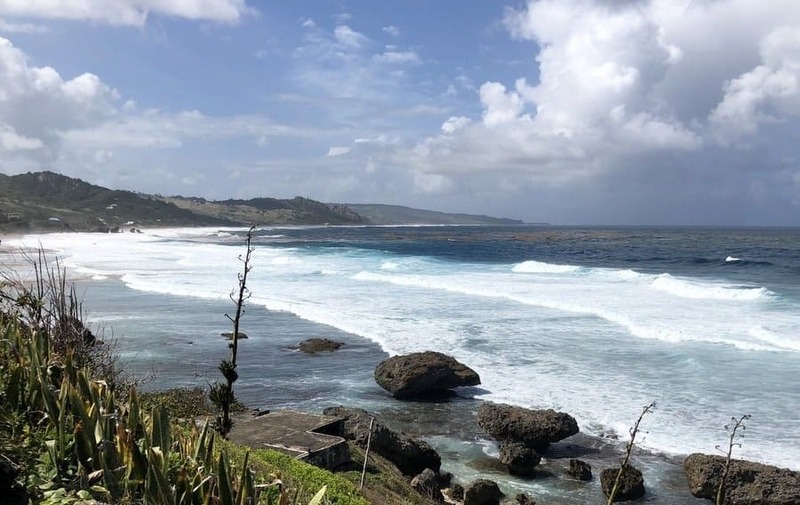 Much of the land along the East Coast is protected, so there’s less major development than in other parts of the island and it retains a rugged unspoiled beauty. 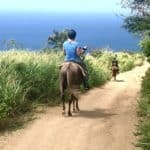 If you’re arriving by cruise ship to Barbados there’s a whole range of excursions which show you the best of Barbados in less than a day. Let’s start at the most northerly point of the island just as it curves towards the east coast. I wanted to visit the Animal Flower Cave where sea anemones live in rock pools within the cave and you can swim up to openings in the cliff face for beautiful views of the ocean. It’s also a good place to spot whales during the season. Sadly, the cave was shut and it was too blustery to go in but there are epic views of the raging waters, crashing waves and rugged peaks from the top of the cliffs. Totally exhilarating. The nearby restaurant serves lunches accompanied by breath-taking views. Local crafts are on sale in some colourful huts near the entrance. We may have got a slightly lost on our Bajan road trip. Road signs are quite small and few and far between. We used a paper map as there was no sat nav in the car and we didn’t want roaming costs. Some quirkily named places like Pie Corner, The Risk and Boscobelle did seem to crop up more than once – I’m sure we went around in circles at least twice. Not all the roads are coastal and on an inland section we passed this photogenic ruined building near St Clement’s church. I posted to Instagram wondering why it hadn’t been pulled down and got an answer from a local. 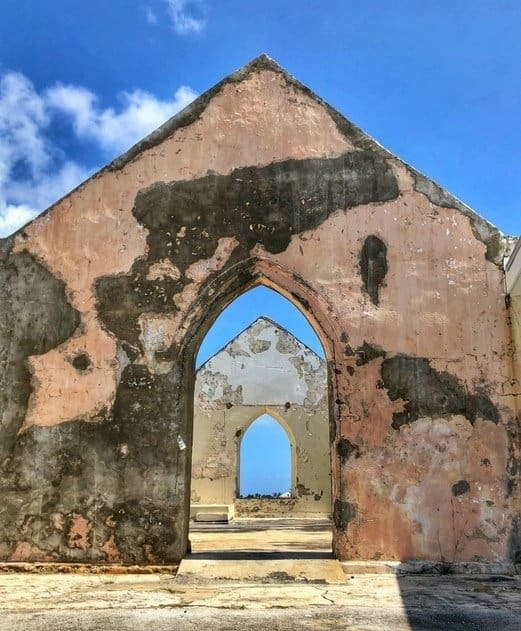 It seems Barbadians are reluctant to pull down old buildings, especially religious ones. The ruin is believed to have served as part of the original school at St Clements. I loved the contrast between the pale, flaking paint and the crisp blue skies beyond. 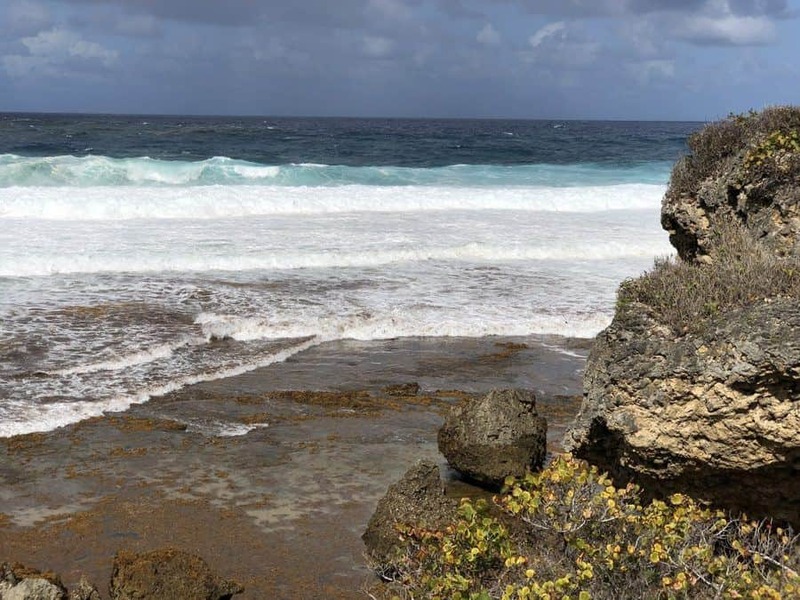 Parts of East Coast Barbados take a little more work to find. Cove Bay was a bit of a trek to get to but well worth it. We drove through a field, past a disused sugar mill and down a dirt track for this epic view. There was no-one else around, except for a few cows and goats. Under the shade of the palm trees would’ve made the perfect picnic spot. Little Bay is a dramatic spot with pools and blow holes and is just a few minutes’ drive from Cove Bay. Again, it was quiet with only one other couple around. You can just see them bathing in the natural pools which shows just how big the beach, and those waves, really are. I don’t think I’ve ever seen as many different shades of blue as when I stood on this spot. If you’re paying a visit to St Nicolas Abbey you must also visit Cherry Tree Hill. Turn left when you leave the Abbey drive and pass through the majestic avenue of mahogany trees. 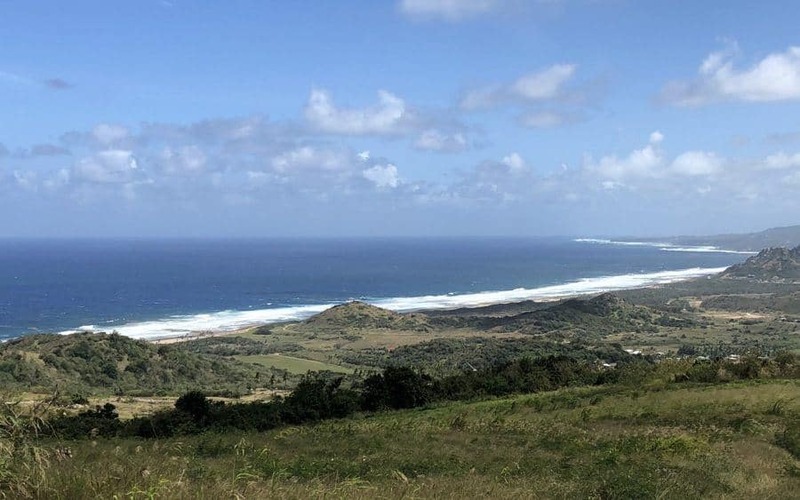 The road leads to a spectacular view of the entire East Coast of Barbados. 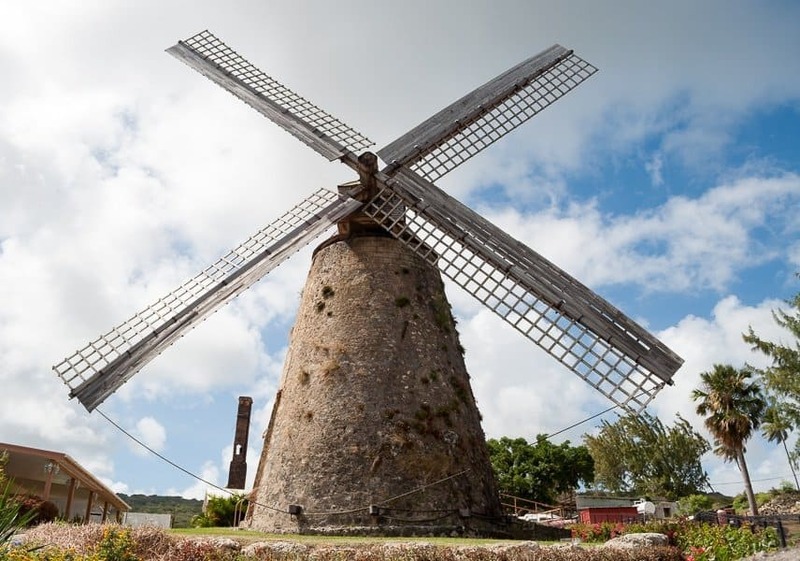 The Morgan Lewis Sugar Mill is the last of the many Barbadian sugar producing windmills and one of only two functioning sugar windmills in the world. It stopped production in 1947 and the sails stood still until it was donated to the Barbados National Trust and renovated. The mill, one of the seven wonders of Barbados, houses a small museum and during the sugar cane season sweet cane juice is provided for visitors one Sunday a month. Bathsheba is probably the most striking and magnificent of east coast Barbados beaches. Large, mushroom-like, rock formations sprouting from the sands have broken away from an ancient coral reef. Bubbling white surf races across the sands making it one of the best Caribbean surfing spots and the beach is home to the ‘Soup Bowl’ surf championship held each year on the island. 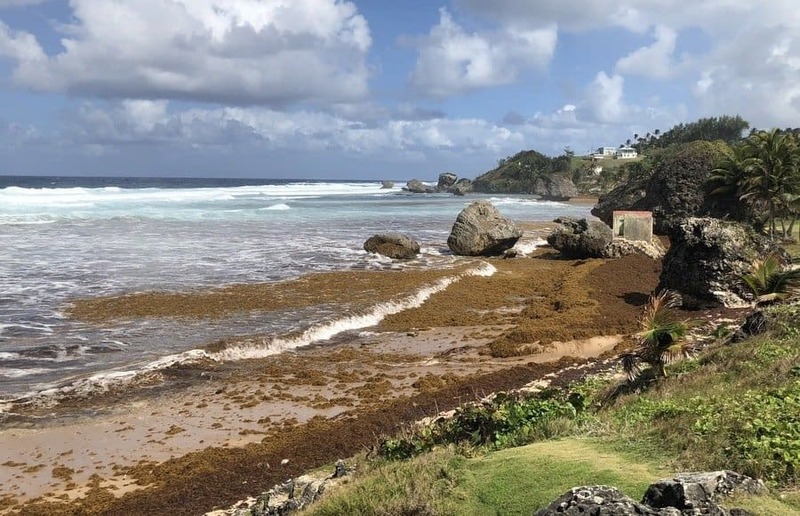 Bathsheba is the main fishing village in St Joseph parish. 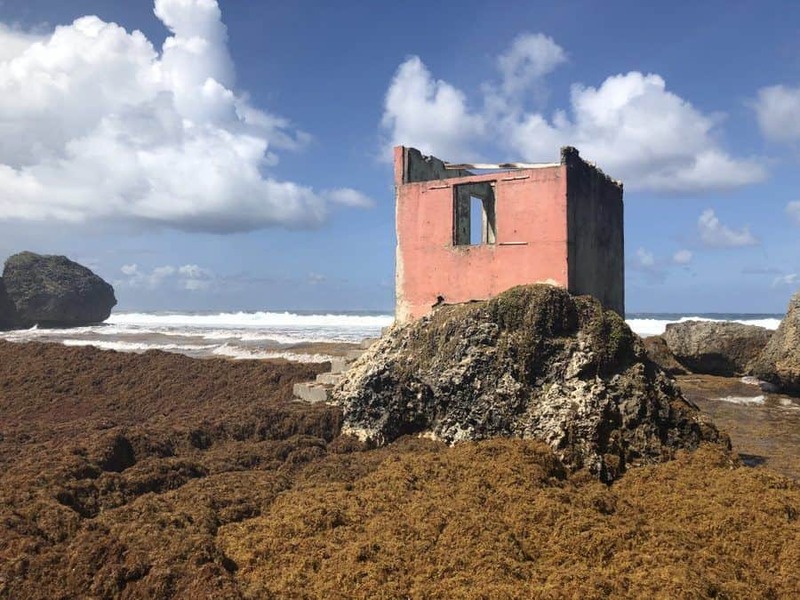 Although tourism has taken over somewhat there are still remnants of the colourful fishing community to be seen in the colourful little houses and ruins near to the shore which are oh so Instagramable! 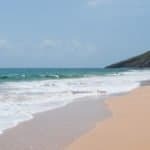 Although the coastline from Cattlewash to Bathsheba is spectacular there are dangerous rip tides, currents and undertows. Swimming is unsafe so stick to a paddle in one of the many coral pools known as Barbados hot tubs. A twenty minute drive inland from Bathsheba, in the centre of the island, is Harrison’s Cave one of the island’s most popular attractions. Harrison’s Cave is a huge underground cave system with streams running through and is over 2 kilometres long. The Great Hall, which is the largest cavern, measures 15 metres high. Finishing at the centre of the island means you’re good to go in any direction for the rest of your Bajan road trip. We headed back to our hotel just in time for sundowners on the beach and a stunning sunset. 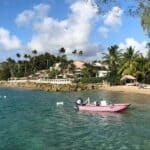 I’ve compiled a Google map with all the points in this post so if you should ever find yourself in Barbados you’ll know exactly where to find these beautiful places. In Barbados they drive on the left hand side of the road, just like the UK, so we felt quite at home! Our car hire cost $110 for 24 hours but was worth it to see the island. Check for up to date car hire prices. If you don’t fancy driving then you may like to consider an organised tour for your sightseeing trip of Barbados. 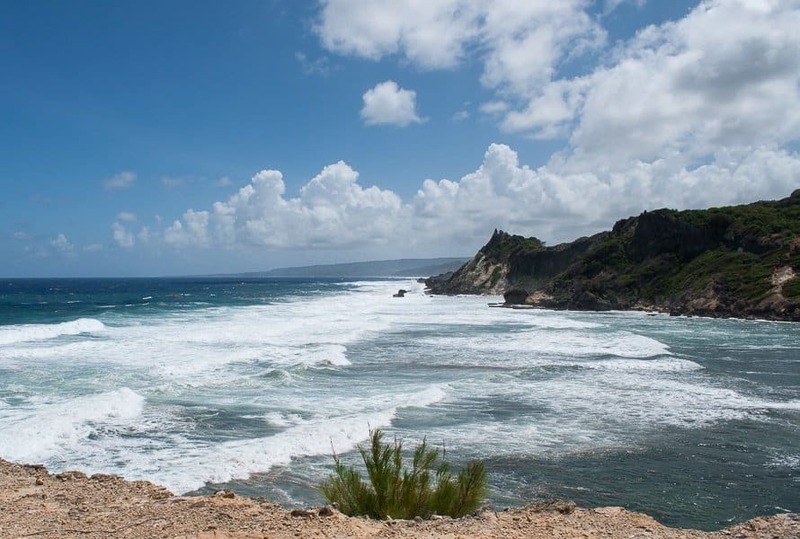 Check prices for a Coastal Sightseeing Tour of Barbados. This post contains affiliate links. By using affiliate links, we earn a small (tiny!) 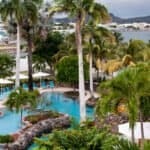 commission when you book a room, tour or buy a product, etc. Don’t worry – you don’t pay any extra. I haven’t been to Barbados but I must say I didn’t realise how rugged and wild this part of the coast is, it makes me want to go and explore! We loved our day exploring, the scenery was epic although there were still some great lookout points that we didn’t have time for. I’ve definitely got the taste for the Caribbean at the moment and Barbados looks right up my street! Love islands with a wilder side too, makes a great contrast to the postcard beaches. 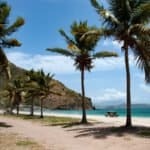 You really can’t go wrong with the Caribbean – wonderful weather, beautiful beaches, great food and totally chilled! Stunning coast line – rocks and oceans is a magical combination. Magical images too!!! I love a dramatic coastline – so much more interesting than tranquil and calm. But not all the time! It looks spectacular, Suze, but I know I couldn’t afford it. The seas were pretty amazing at Seaham on the north east coast the other day too. Just needed to nudge the temperature guage up a little. 🙂 🙂 Hope you’re having a lovely Easter break. I do love a wild and dramatic coastline – nothing like it for blowing away the cobwebs! Chilly down here to Jo – quiet Easter for us but it’s good to relax once in a while. Hope yours is good too. 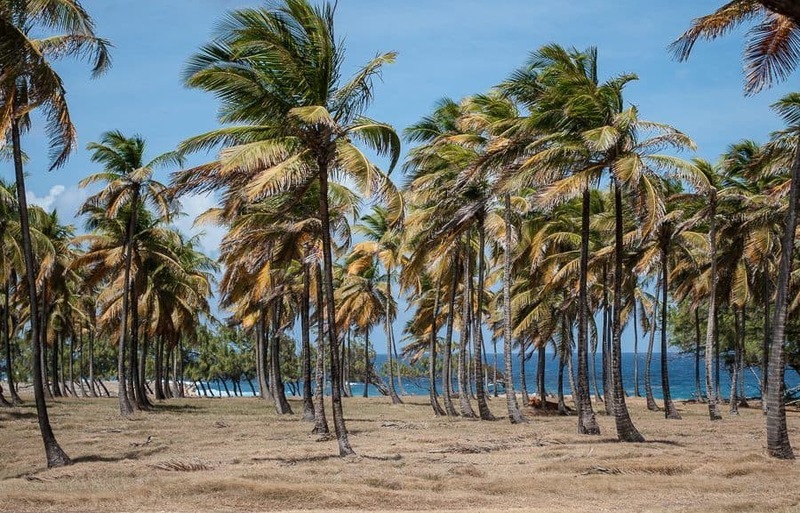 I’ll be honest, while all these Caribbean islands look utterly delicious, I admit I’m more drawn to wilder, more rugged landscapes than cute, tropical scenes – so this is a real surprise and my kind of day trip. Those palm trees…never seen a photograph like it, absolutely stunning! Happy Easter!!! Wow magical images of the rugged coastline – beautiful. Never been to the West Indians. My favourite here is the Animal Flower Cave. As always a splendid post – and the images. It’s like being there. Thanks!!! Just what I needed this day with only shades of grey.